Linguistic / Raising a reader! An increasing number of studies show that promoting reading can have a great impact on children and their future. Among the benefits of reading for pleasure you have that literacy skills, vocabulary, and general knowledge increase, as well as the self-confidence and community participation.There are many things parents can do to promote reading and raise a happy reader! It’s pretty simple, really. It all starts with you, the parents! Research shows that reading books to your little one is the most important thing you can do to prepare him for reading and learning. But why limit yourself to simply reading words off a page? Why not take it one –or a few– steps further? Here are a few simple tips and tricks that will certainly help you on your way to raising a reader! Get excited! – Make sure that your child sees your excitement for reading time! He will share it too! Improvise – Let the actor in you shine! Use different accents for the characters and add a little drama with hand gestures, sound effects, and facial expressions. Point – Point to pictures and talk about them! Interact – Every now and then pause and ask your little one questions about the story, alternate endings, characters’ feelings, etc. Multitask – Reading time is not limited to bedtime stories! You can read during mealtime or bathtime too! Play with words – Babies love rhyming and songs! Choose books that feature them and see how much you child enjoys them and learn from them! Make a habit out of it – Start reading aloud very early on and incorporate it into your daily routine! 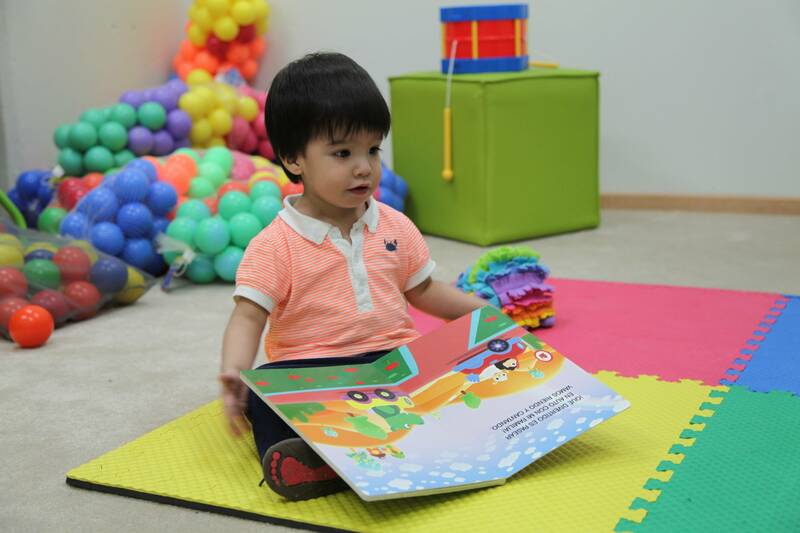 Books everywhere – Make sure that you have a variety of books to read, and that they are a natural part of your little one’s environment. Personalize the experience – Research shows that children who have books of their own enjoy reading more and do it more often. Field trips! – Incorporate trips to the local library or join a reading club for children. Show the love – It’s important for your child to see his parents enjoy reading too –after all, you are their first and most important teacher. As you can see, there are many things you can do to promote literacy development, and they are all easy to do! We can’t stress enough the importance of adding reading time into your daily routine. It has many benefits: language development, brain development, and parent-child bonding are just some of them. Reading and books should be a part of your daily life. This week, why don’t you introduce one of your own childhood favorites to your little one? He will enjoy reading your selection and, who knows, maybe he’ll love it as well! It all starts with you, the parents! Because research shows that reading books to your little one is the most important thing you can do to prepare your child for reading and learning.